(Newser) – John Boehner planned a strategy session later today with House Republican leaders to plot their next move, but the prospects of avoiding a government shutdown before Monday's midnight deadline are getting bleaker by the hour, reports Politico. For one thing, no negotiations between Republicans and Democrats are even on the horizon, because both sides feel they've already staked out their positions. The Hill also thinks a shutdown is "increasingly likely," and USA Today has rolled out a primer on what it would mean to ordinary citizens: Yes, you'll get your mail, and neither Medicare, Social Security, nor Medicaid will be affected. Why worry for a budget now ! Pres. Obama did not worry for a budget for his first two years as Pres. ??? And with control of both Houses !!!!!!!!!!!!! (R) 2016 Gov. RICK PERRY Report: The SuperCommittee like to tell the Democrats be sure to turn off the lights before shut down the Obama government. 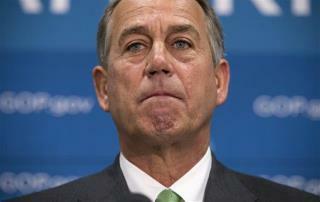 Mr. John Boehner you are a Satan and so is anyone associated with you. One more year and the broom will come to restore democratic majority thanks to you. You don't hold entire country a hostage for what you republicans did.